The Sikorsky CH-53E Super Stallion is the largest and heaviest helicopter in the United States military. As the Sikorsky S-80 it was developed from the CH-53 Sea Stallion, mainly by adding a third engine, adding a seventh blade to the main rotor and canting the tail rotor 20 degrees. It was built by Sikorsky Aircraft for the United States Marine Corps. The less common MH-53E Sea Dragon fills the United States Navy’s need for long range minesweeping or Airborne Mine Countermeasures (AMCM) missions, and perform heavy-lift duties for the Navy. Under development is the CH-53K King Stallion, which will be equipped with new engines, new composite material rotor blades, and a wider aircraft cabin. The CH-53 was the product of the U.S. Marines’ “Heavy Helicopter Experimental” (HH(X)) competition begun in 1962. Sikorsky’s S-65 was selected over Boeing Vertol’s modified CH-47 Chinook version. The prototype YCH-53A first flew on 14 October 1964. The helicopter was designated “CH-53A Sea Stallion” and delivery of production helicopters began in 1966. The first CH-53As were powered by two General Electric T64-GE-6 turboshaft engines with 2,850 shp (2,125 kW) and had a maximum gross weight of 46,000 lb (20,865 kg) including 20,000 lb (9,072 kg) in payload. Variants of the original CH-53A Sea Stallion include the RH-53A/D, HH-53B/C, CH-53D, CH-53G, and MH-53H/J/M. The RH-53A and RH-53D were used by the US Navy for mine sweeping. The CH-53D included a more powerful version of the General Electric T64 engine, used in all H-53 variants, and external fuel tanks. The CH-53G was a version of the CH-53D produced in West Germany for the German Army. The US Air Force’s HH-53B/C “Super Jolly Green Giant” were for special operations and combat rescue and were first deployed during the Vietnam War. The Air Force’s MH-53H/J/M Pave Low helicopters were the last of the twin engined H-53s and were equipped with extensive avionics upgrades for all weather operation. In October 1967, the US Marine Corps issued a requirement for a helicopter with a lifting capacity 1.8 times that of the CH-53D that would fit on amphibious warfare ships. The US Navy and US Army were also seeking similar helicopters at the time. Before issue of the requirement Sikorsky had been working on an enhancement to the CH-53D, under the company designation “S-80”, featuring a third turboshaft engine and a more powerful rotor system. Sikorsky proposed the S-80 design to the Marines in 1968. The Marines liked the idea since it promised to deliver a good solution quickly, and funded development of a testbed helicopter for evaluation. In 1970, against pressure by the US Defense Secretary to take the Boeing Vertol XCH-62 being developed for the Army, the Navy and Marines were able to show the Army’s helicopter was too large to operate on landing ships and were allowed to pursue their helicopter. Prototype testing investigated the addition of a third engine and a larger rotor system with a seventh blade in the early 1970s. In 1974, the initial YCH-53E first flew. Changes on the CH-53E also include a stronger transmission and a fuselage stretched 6 feet 2 inches (1.88 m). The main rotor blades were changed to a titanium-fiberglass composite. The tail configuration was also changed. The low-mounted symmetrical horizontal tail was replaced by a larger vertical tail and the tail rotor tilted from the vertical to provide some lift in hover while counteracting the main rotor torque. Also added was a new automatic flight control system. The digital flight control system prevented the pilot from overstressing the aircraft. YCH-53E testing showed that it could lift 17.8 tons (to a 50-foot (15 m) wheel height), and without an external load, could reach 170 knots (310 km/h) at a 56,000 pound gross weight. This led to two preproduction aircraft and a static test article being ordered. At this time the tail was redesigned to include a high-mounted, horizontal surface opposite the rotor with an inboard section perpendicular to the tail rotor then at the strut connection cants 20 degrees to horizontal. The initial production contract was awarded in 1978, and service introduction followed in February 1981. The first production CH-53E flew in December 1980. The US Navy acquired the CH-53E in small numbers for shipboard resupply. The Marines and Navy acquired a total of 177. 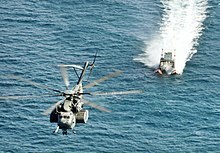 The Navy requested a version of the CH-53E for the airborne mine countermeasures role, designated “MH-53E Sea Dragon”. It has enlarged sponsons to provide substantially greater fuel storage and endurance. It also retained the in-flight refueling probe, and could be fitted with up to seven 300 US gallon (1,136 liter) ferry tanks internally. The MH-53E digital flight-control system includes features specifically designed to help tow minesweeping gear. The prototype MH-53E made its first flight on 23 December 1981. MH-53E was used by the Navy beginning in 1986. The MH-53E is capable of in-flight refueling and can be refueled at hover. Additionally, a number of MH-53E helicopters were exported to Japan as the S-80-M-1 for the Japan Maritime Self-Defense Force (JMSDF). The base model CH-53E serves both the US Navy and Marines in the heavy lift transport role. It is capable of lifting heavy equipment including the eight-wheeled LAV-25 Light Armored Vehicle, the M198 155 mm Howitzer with ammunition and crew. The Super Stallion can recover aircraft up to its size, which includes all Marine Corps aircraft except for the KC-130. The 53E needs 40 maintenance hours per flight hour due to aging parts, lack of available new replacement parts and the extension of the overall airframe lifetime. The US Marine Corps had been planning to upgrade most of their CH-53Es to keep them in service, but this plan stalled. 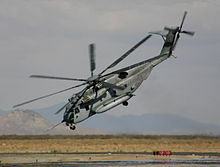 Sikorsky then proposed a new version, originally the “CH-53X”, and in April 2006, the USMC signed a contract for 156 aircraft as the “CH-53K”. 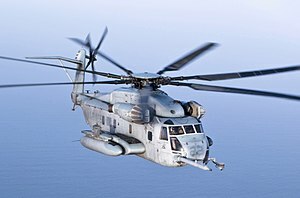 The Marines are planning to start retiring CH-53Es in 2009 and need new helicopters very quickly. In August 2007, the USMC increased its order of CH-53Ks to 227. First flight was planned for November 2011 with initial operating capability by 2015. Although dimensionally similar, the three engine CH-53E Super Stallion or Sikorsky S-80 is a much more powerful aircraft than the original Sikorsky S-65 twin engined CH-53A Sea Stallion. The CH-53E also added a larger main rotor system with a seventh blade. The CH-53E can transport up to 55 troops or 30,000 lb (13,610 kg) of cargo and can carry external slung loads up to 36,000 lb (16,330 kg). The Super Stallion has a cruise speed of 173 mph (278 km/h) and a range of 621 miles (1,000 km). The helicopter is fitted with a forward extendable in-flight refueling probe and it can also hoist hose refuel from a surface ship while in hover mode. It can carry three machine guns: one at the starboard side crew door; one at the port window, just behind the copilot; and one at the tail ramp. The CH-53E also has chaff-flare dispensers. The MH-53E features enlarged side mounted fuel sponsons and is rigged for towing various minesweeping and hunting gear from above the dangerous naval mines. The Sea Dragon can be equipped for minesweeping, cargo and passenger transportation, and troop insertion. Its digital flight-control system includes features specifically designed to help towing mine sweeping gear. Upgrades to the CH-53E have included the Helicopter Night Vision System (HNVS), improved .50 BMG (12.7 mm) GAU-21/A and M3P machine guns, and AAQ-29A forward looking infrared (FLIR) imager. The CH-53E and the MH-53E are the largest helicopters in the Western world, while the CH-53K now being developed will be even larger. They are fourth in the world to the Russian Mil Mi-26 Halo single-rotor helicopter and the enormous, twin transverse rotored Mil V-12 Homer, which can lift more than 22 tons (20 tonnes) and 44 tons (40 tonnes), respectively and the Mi-26’s single-rotor predecessor Mil Mi-6, which has less payload (12 tonnes) but is bigger and has a higher MTOW at 42 tonnes. The Super Stallion variant first entered service with the creation of Heavy Marine Helicopter Squadron 464 at Marine Corps Air Station New River, North Carolina. Two more squadrons were created at Marine Corps Air Station Tustin, California over the next several years, HMH-465 and HMH-466. In addition, one west coast training squadron, HMT-301, was given Super Stallions as was one more east coast squadron, HMH-772, out of a reserve base at NASJRB Willow Grove, Pennsylvania. Since then, other Marine Heavy lift squadrons have retired their CH-53As and Ds, replacing them with Es. The Marine Corps CH-53E saw its first shipboard deployment in 1983 when four CH-53E helicopters from HMH-464 deployed aboard USS Iwo Jima as part of the 24th Marine Amphibious Unit (24th MAU). During this deployment Marines were sent ashore in Beirut, Lebanon as peace keepers and established perimeters at and near the Beirut International Airport. On 23 October 1983 a truck bomb detonated by terrorists destroyed the Marine barracks in Beirut, killing nearly 240 service members as they slept. CH-53E helicopters from the 24th MAU provided critical combat support during this operation. In 1991, two CH-53Es along with several CH-46 Sea Knight helicopters were sent to evacuate U.S. and foreign nationals from the U.S. embassy in Mogadishu, Somalia—Operation Eastern Exit—as violence enveloped the city during the Somalian Civil War. During Operation Desert Storm, MH-53E shipboard based Sea Dragons were used for mine clearing operations in the Persian Gulf off Kuwait. On 8 June 1995, Captain Scott O’Grady, an F-16 Fighting Falcon pilot shot down over Bosnia, was rescued by two CH-53Es. On 26 October 2001 3 CH-53Es aboard USS Peleliu and 3 CH-53Es aboard USS Bataan flew 550 miles (890 km) to secure the first land base in Afghanistan, Camp Rhino, with 1100 troops at its peak. This amphibious raid is the longest amphibious raid in history. The long range capability of the CH-53Es enabled Marines to establish a southern base in Afghanistan, putting the war on the ground. Super Stallions again played a major role in the 2003 invasion of Iraq. They were critical to moving supplies and ammunition to the most forward Marine units and also assisted in moving casualties back to the rear for follow on care. Marine CH-53Es and CH-46Es carried US Army Rangers and Special Operations troops in a mission to rescue captured Army Private Jessica Lynch on 1 April 2003. Currently about 150 CH-53E helicopters are in service with the Marines and another 28 MH-53Es are in service with the U.S Navy. The CH-53 requires 44 maintenance hours per flight hour. A flight hour costs about $20,000. United States military designation for two Sikorsky S-65E (later S-80E) prototypes. United States military designation for the S-80E heavy lift transport variant for the United States Navy and Marine Corps, 170 built. United States military designation for the S-80M mine-countermeasures variant for the United States Navy, 50 built. Proposed presidential transport variant, not-built. Export variant of the heavy lift transport variant, not-built. Export variant of the mine-countermeasures variant, 11-built for Japan. The last were retired in 2017.